One of the most controversial topics on those Mommy ‘support’ group blogs and message boards, beside the great formula vs breast debate, is the decision on whether or not to vaccinate your child. It starts with one mommy posting that she is taking her 2 month old for their first round of immunizations and asks which pain reliever is most recommended in case of discomfort. Suddenly the wall explodes in a series of exclamation points, capital letters and links to various websites either extolling the ‘virtues’ of vaccines or condemning those who chose to ‘inflict’ that ‘unnecessary’ pain on their infants. As I’ve mentioned before, everyone can find a website backing up their particular brand of crazy so in this case you need to do your own research and find the path that you and your family are most comfortable with. This was another topic that Andrew and I discussed while I was pregnant, what we were and were not comfortable with medically when it came to our son. Our conclusion? Vaccinations would be done as suggested, including dates, dosage and type, for those that are universally recommended for infants and children. This includes whooping cough, measles etc and are administered at 2 months, 4 months, 6 months, 12 months and 18 months I believe. The ones we decided to hold off on were the atypical vaccines like chicken pox and the flu, seeing as we’ve both had those illnesses and never experienced any difficulties. V was a special case because he was a preemie. Vaccines are not pushed back to his ‘corrected’ age, they are done based on his actual birth date. Therefore V received his first round of immunizations before he was actually supposed to be born! No harm, no foul, and we never experienced even the slightest crankiness or fever from any mediation he received. He also qualified for the special RSV vaccine that children with weak immune systems, or preemies born before 36 weeks are eligible for. RSV can be present with any type of cold or respiratory infections and while it’s not dangerous for most of population it can land a preemie a long trip back to the ICU. That particular vaccine was given monthly between Nov and May of V’s first year and again we never had any issues. 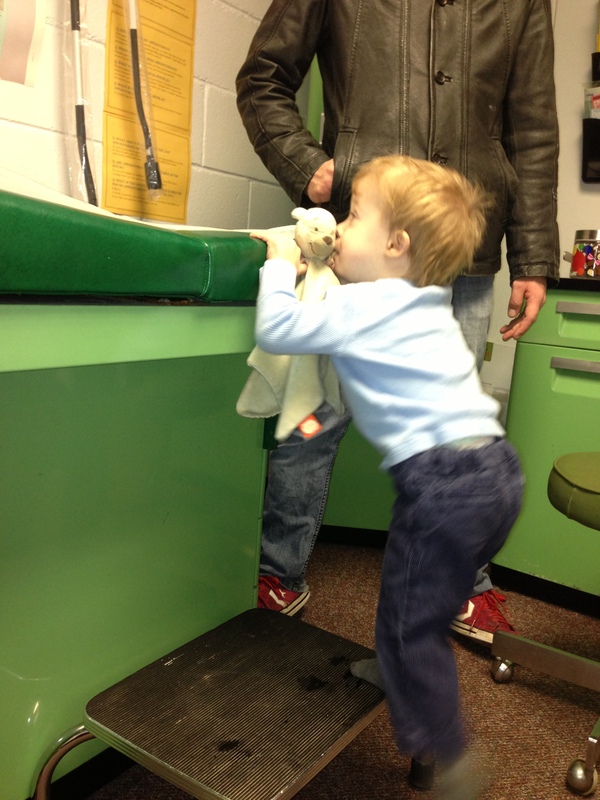 The doctors were amazing each time it was time for V to receive his needles. They would have a nurse practitioner and a doctor in at the same time to make sure he got both needs simultaneously and quickly. Blink and it’s over, and when it came to V, after a big cry he’d forgotten about it less than 10 minutes later. When he got to the year mark they switched from giving the immunizations in the thigh to his upper arms so that when he was trying his best to learn to scramble around the soreness in his legs wouldn’t discourage him from using his legs to get around. Being a parent it was always hard to hear him cry but honestly it was over so quickly and A and I truly believe we made the best decision we could for our child. V has honestly cried more when the doctor has tried to look in his ears than when he’s had his shots, what a little drama king! Why immunize you ask? Who’s even heard of small pox/whooping cough/mumps these days? 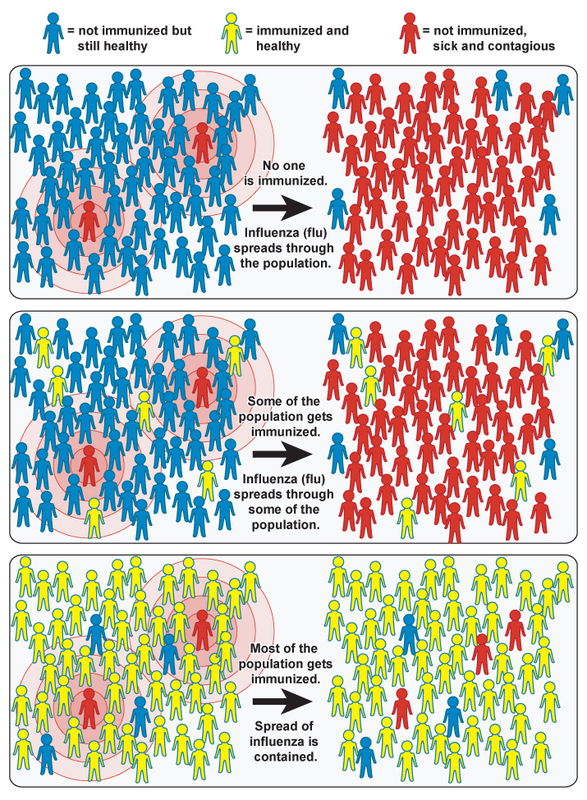 Well being a biology major in university you learn about this amazing thing called herd immunity. Basically what it boils down to is that SO many kids have been vaccinated to prevent a certain illness that it almost never occurs anymore! Not that it has been irradiated but that there are so few people who are susceptible to it that it is unlikely to show in your general population. You’ll still hear about the occasional outbreak, probably somewhere were vaccines aren’t as readily available, but here in Canada? Not so much. A lot of parents use this as a reason to not have their children vaccinated but the ONLY reason you don’t hear of it is BECAUSE so many kids have had the vaccine! This type of immunity only works if the majority of the population is protected and by choosing not to vaccinate you only antagonize the issue. Personally I’m not about to trust anyone else with the health of my child. Why trust others to vaccinate their kids and then cross my fingers for my own? To me at least, vaccination is the only way to ensure my child isn’t that human interest piece on the news who’s been hospitalized and treated for some illness people only hear of in history books. Another reason that parents are reluctant to immunize their child is the widely publicized and widely discredited study that linked infant vaccinations to the prevalence of autism and autism spectrum disorders in our community. Many parents focus on the ‘Jenny McCarthy’ circus where parents of children affected by autism, understandably, look for a cause and decide to pin it on immunizations. I can’t even imagine how hard it would be to have a child dealing with such an illness, one that really cuts them off from society and their peers, however there have been countless studies discrediting the former and I believe that research funds would be better directed elsewhere, like a treatment or cure. Of course people will believe what they want to and if they are not honestly comfortable vaccinating their children then there isn’t much you can do to sway them, nor should you, because its a very individual choice for each family. One main reason we decided in favour of vaccination was that we would never ever forgive ourselves if V experiences any serious, preventable illness, regardless of whether he suffers lifelong complications or worse. Honestly, even as an adult I go in for my regular tetanus vaccine every time it’s needed so why would I deny my child the same right? As parents we wanted to do anything possible to protect our child from everything, including the germy environment around us! After watching him go through a long hospital stay last year there isn’t anything I wouldn’t do to prevent that from happening again! After that hospital stay Andrew and I also changed our stance on the elective vaccines and V will be receiving both the flu and chicken pox vaccines this winter/spring. Another thought on vaccinations that we’re aware of now is that IF we are ever successful in having another child and IF that child ends up being preemie then V would not be able to visit a sibling or relative in the NICU without proof of an up to date vaccination record. Hospitals don’t mess around with that stuff, so maybe we shouldn’t either! Now some parents, especially of preemies, delay their vaccinations. I know some of our NICU companions didn’t get their immunizations until their corrected dates and some families don’t plan on vaccinating until their children move more outside the home for daycare or school. This ensures they have the protection they need when interacting with their peers but doesn’t put the vaccine in their system while they’re still so young. Personally I think this would be harder on the parents and kiddos! V doesn’t remember any of his vaccines so visits to the doctor never bother him. 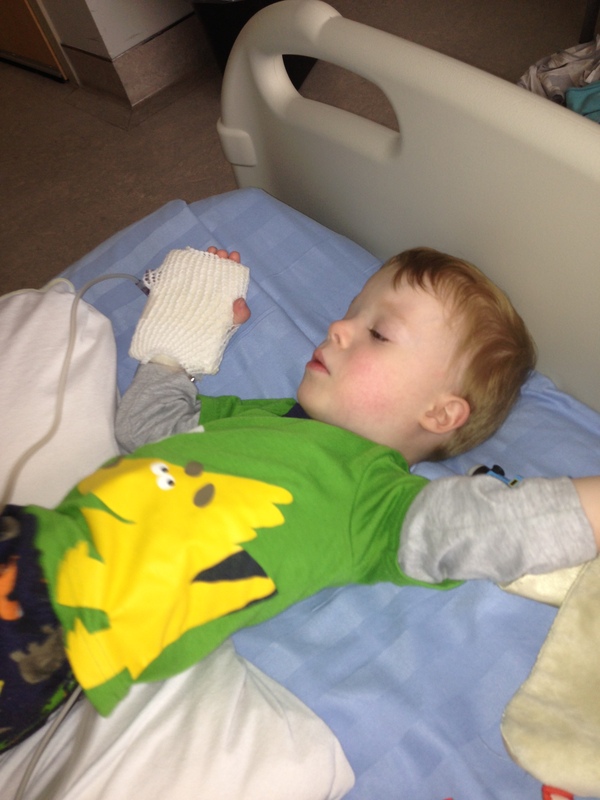 He loves the RN that delivered every one of his injections so not post traumatic stress for this little man. After he had his IV put in at the hospital he even thanked the nurse who did it. Always our polite kiddo! Playing around at the Dr’s office! I think that parents are so vocal when they choose not to vaccinate because they’re usually called out on it or feel they need to justify their decision, but us parents who decide to go with the status quo tend to be a little more reserved. I just wanted to throw in my personal two cents and come out as a parent who, having done my own research and soul searching, sides very strongly with our doctors recommendation to vaccinate. If you respectfully disagree with my position on this topic that is your right as a parent and I would never tell anyone how they ‘should’ raise their child. I’m only sharing my view on this particular topic as a parent who tends to lean a little more on the ‘helicopter’ side when it comes to my baby’s health! What is that saying? An ounce of prevention is worth a pound of cure? LHSC has had more than enough of our time in the last three years and I’m not eager to give them anymore!